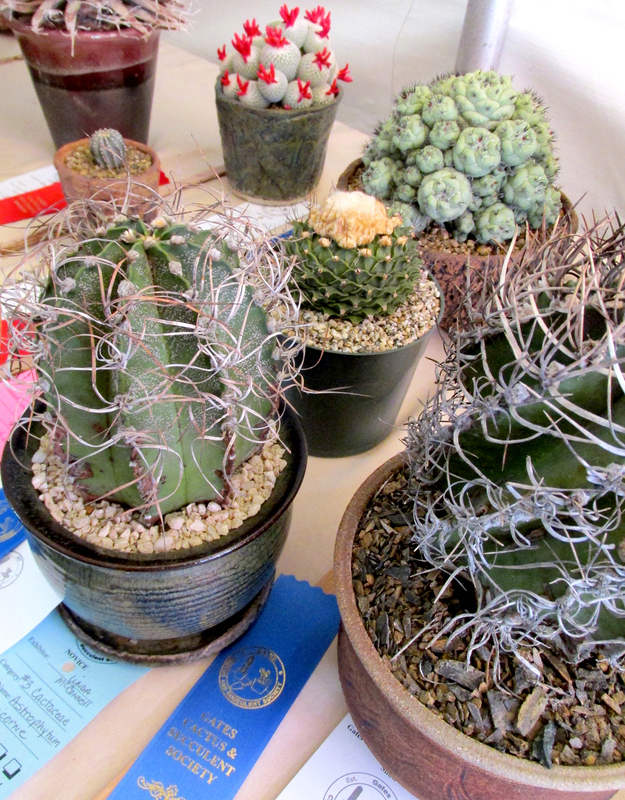 My reason for attending the Gates Cactus & Succulent Society‘s show and sale this weekend was not to buy plants, I didn’t need any; rather it was to take in the juried plant show. 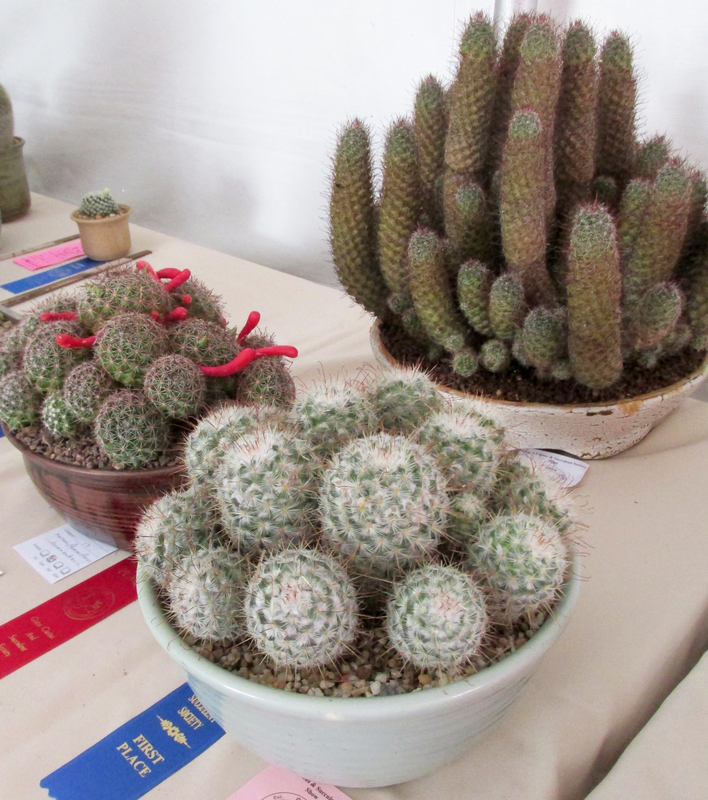 Held in a separate tented area the show was very well-attended and there was no lack of entries. But I had notes, exacerbated by the fact that I was not feeling tip-top upon arrival. First, the show tent was very dark. Saturday was already overcast, so an opaque tent only added to an overall dim/dank feel. 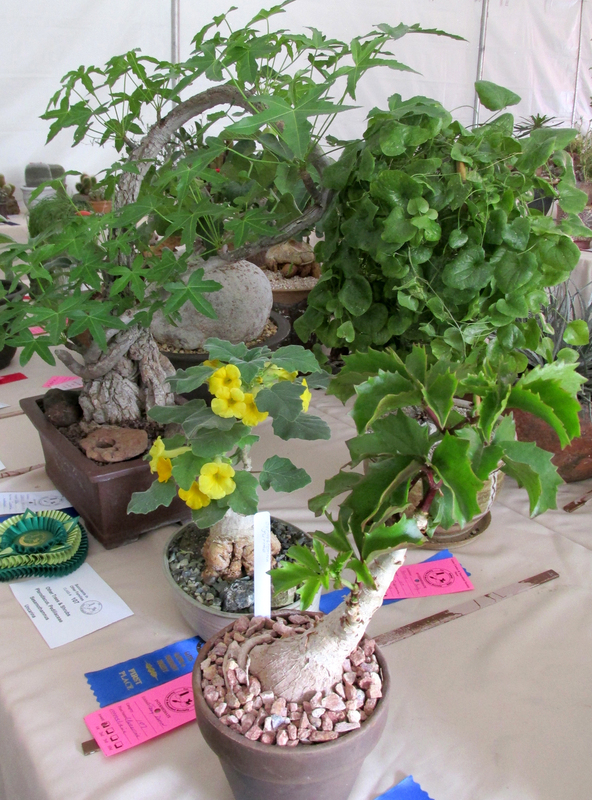 Second, entries were presented too closely together; making photography difficult. This caused viewers to be on top of each other as well, something I did not relish. Also pain-inducing: A winner in several categories expounding on her entries in a voice that channeled both Truman Capote and Angelica Pickles. Try though I might, I could not shake this winner and her entourage, nor could I shake the lady in a fuchsia bedazzled sweatshirt who insisted on inserting herself into my photos! As I said, I was not feeling well. So, I took a deep breath and shot when I could find an opening, moving quickly. Honestly I didn’t have much hope for the photos. But whattaya know, they weren’t bad — hooray for auto-whatever digital cameras! What didn’t work out were my efforts at shooting the entry labels next to individual plants. 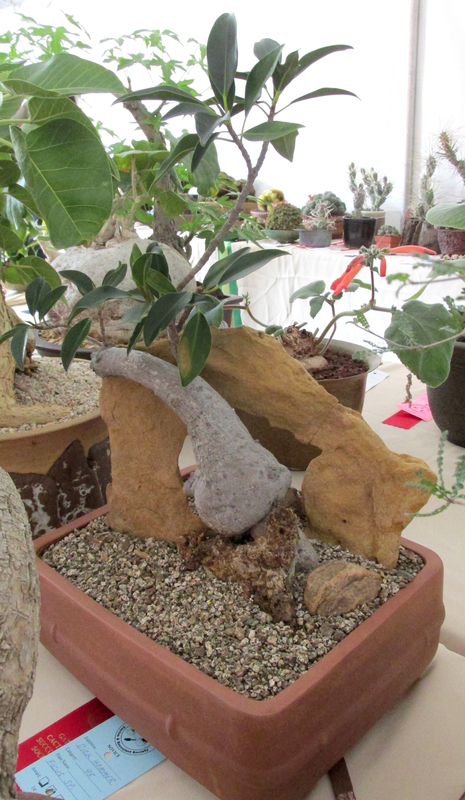 Hence this post will not contain plant names; rather it will feature photos of the plants I found most interesting, in categories of my own devising. Let’s get started, I’ve got a lot to show you. 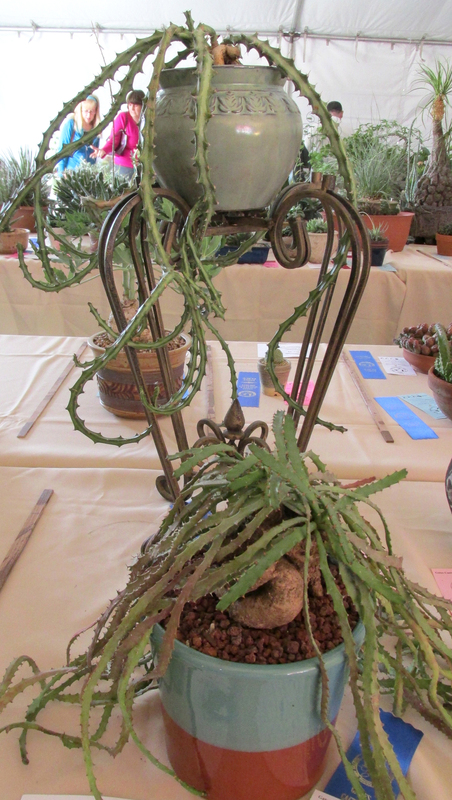 At least three of the plants above were overall winners; in fact, the tallest of them (lower left) was the Oddball Plant winner. 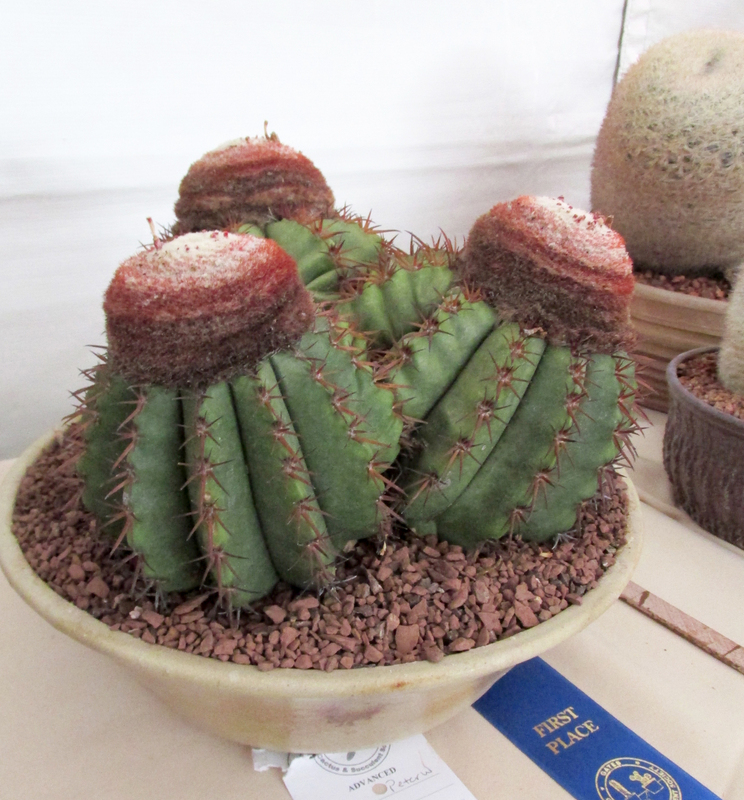 I’m not sure I would’ve picked it since there were far odd-er entries under the tent but no one asked me. 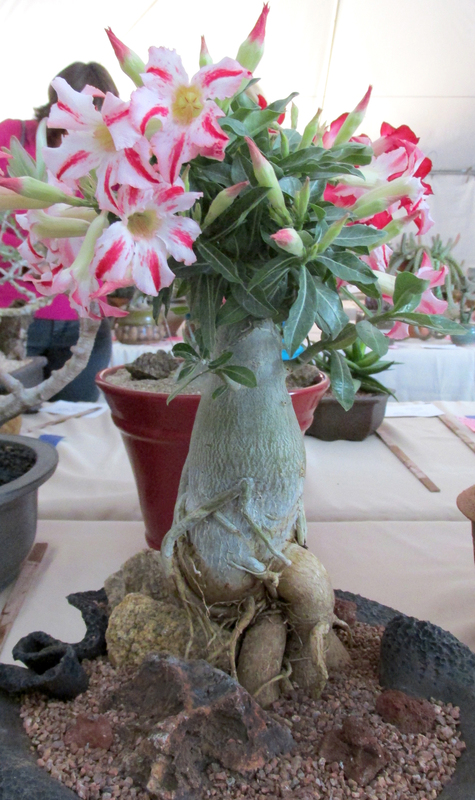 Still, it’s pretty bizarro, kind of like a tall root wearing a feathered hat. 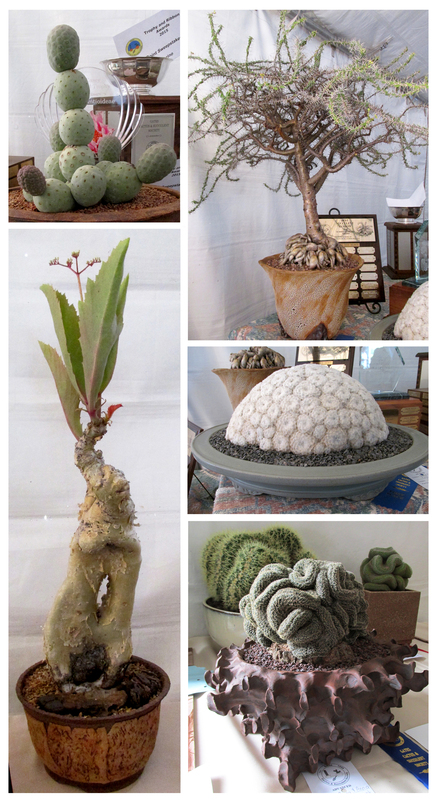 Moving clockwise from it: A seeming snap-off, -on puffball cactus; what appeared to be an ancient and lovely gnarled bonsai; a perfect dome of albino rosettes; a brainy offering surpassed only by the vessel that contains it. Let’s keep it moving, there’s more . . . 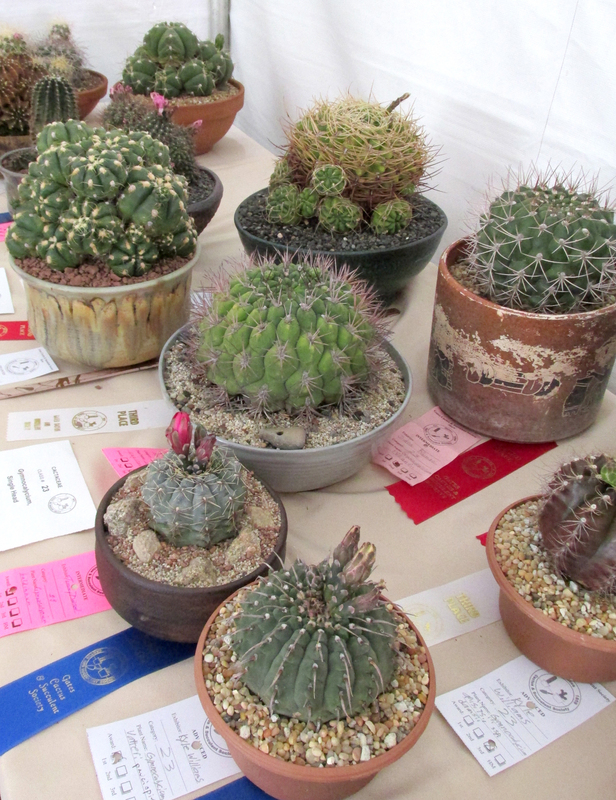 Many, if not all, of these entries are cactus and most are small. 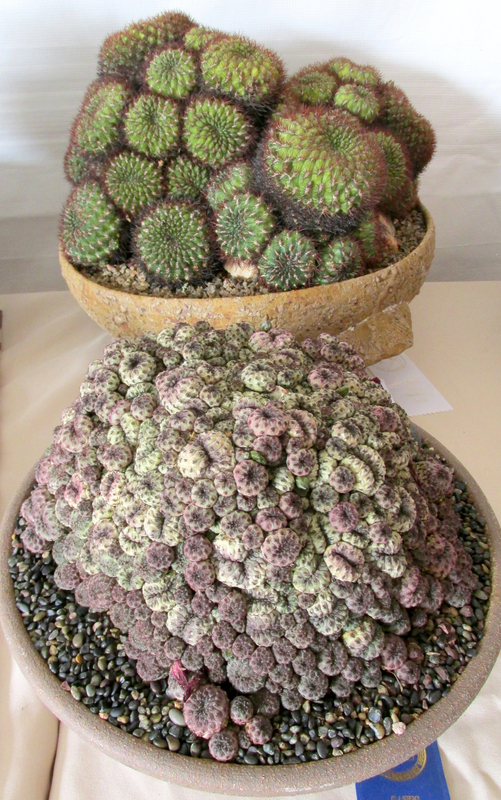 Their diversity in color, shape and form is delightful and their needles a true wonder of nature. From meatballs for masochists to standoffish pincushions; whether striated, tufted or elongated, these plants share a defense mechanism that’s as beautiful as it is hazardous. 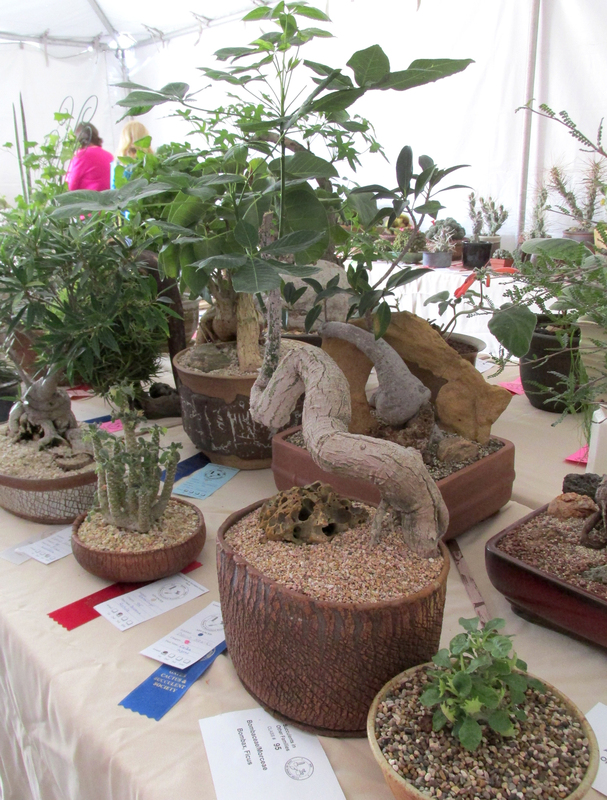 The plants in this group are both beautiful and strange, with tuber-like aboveground roots that sprout with leafy foliage. 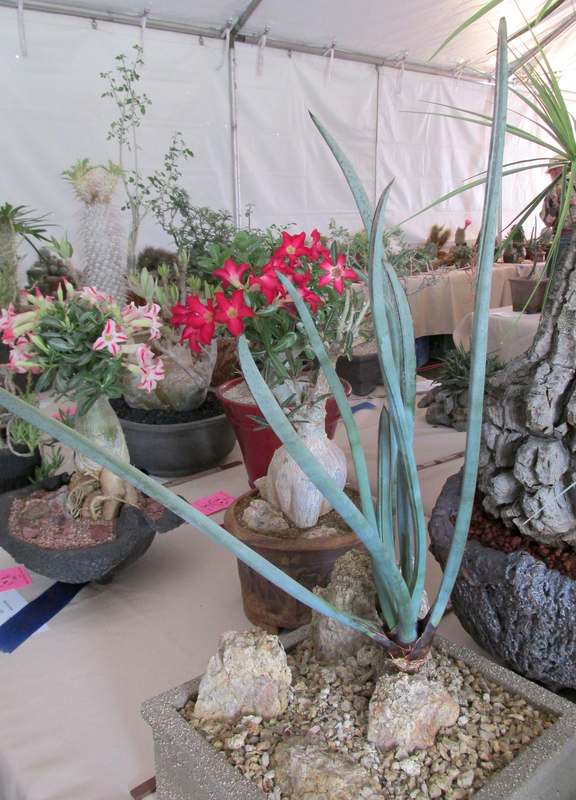 Much diversity here as well, with roots that resemble everything from hand grenades to chubby infants to extraterrestrial creatures; foliage, too, runs the gamut with the occasional bright blossom. 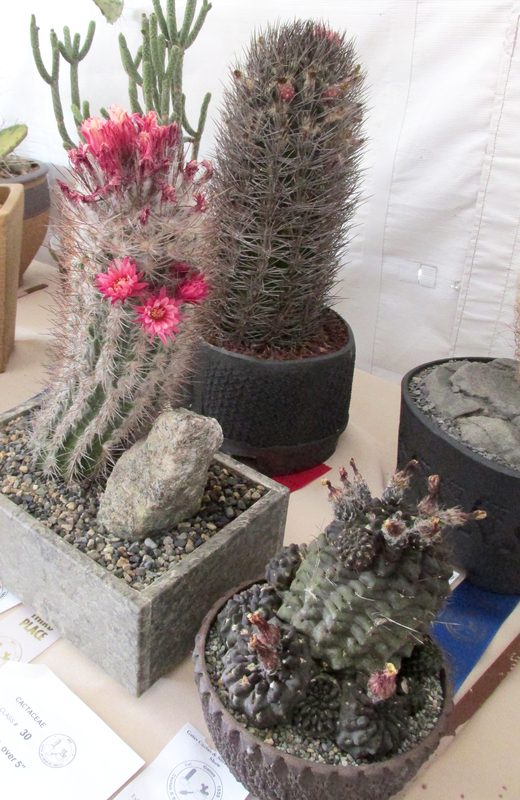 Spiky, furry, claw-like, stony, metallic, sharp, smooth; I chose these plants for this category because of their vast textural range. Colors are also on a wide spectrum with cool blues and grays, deep purple and every type of green. 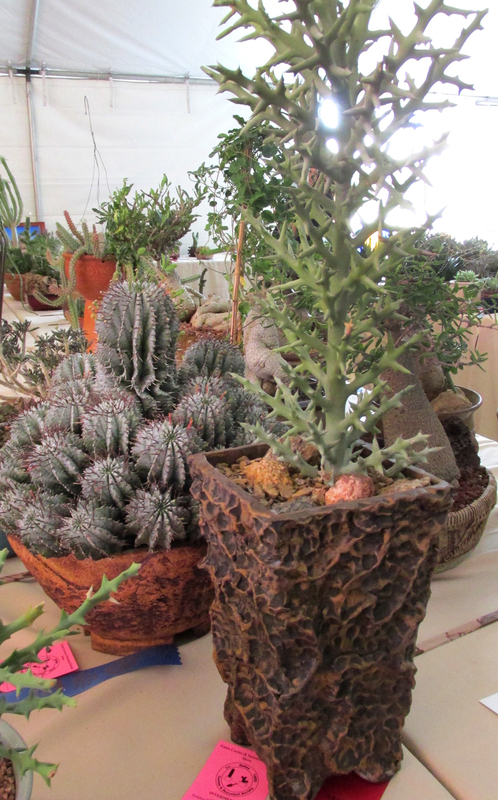 I couldn’t help but touch many of these plants, the same with their pots and vessels . 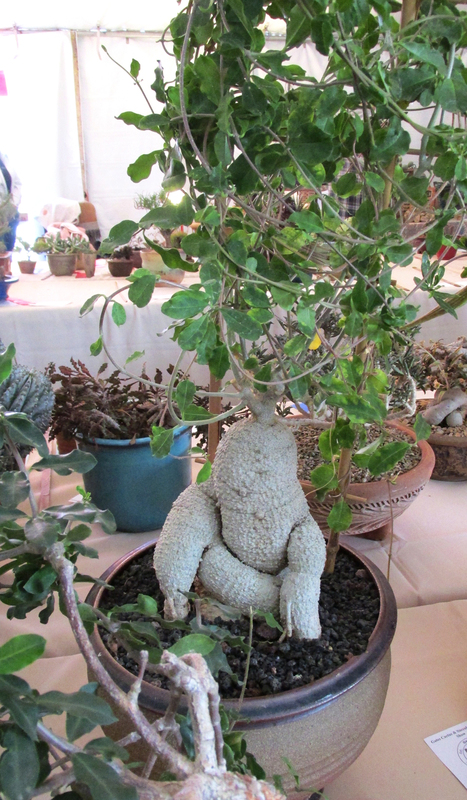 . .
Weirdos all, these plants were both silly and fantastic. The top two resemble side dishes for a Martian’s Thanksgiving dinner, while the next one down has stumped me completely. The next photo could be dim sum topped with pickled ginger, while the last photo appears be the carcass of a headless creature at the moment it was transmogrified into a plant. 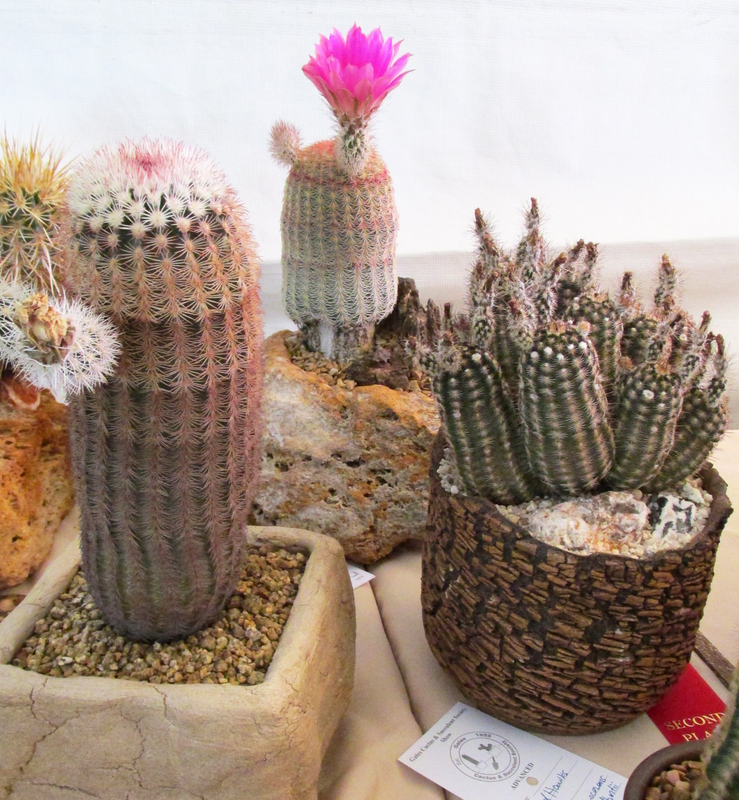 The Gates Cactus & Succulent Society has surely benefitted from the energy and membership of Buck Hemenway and his wife Yvonne. 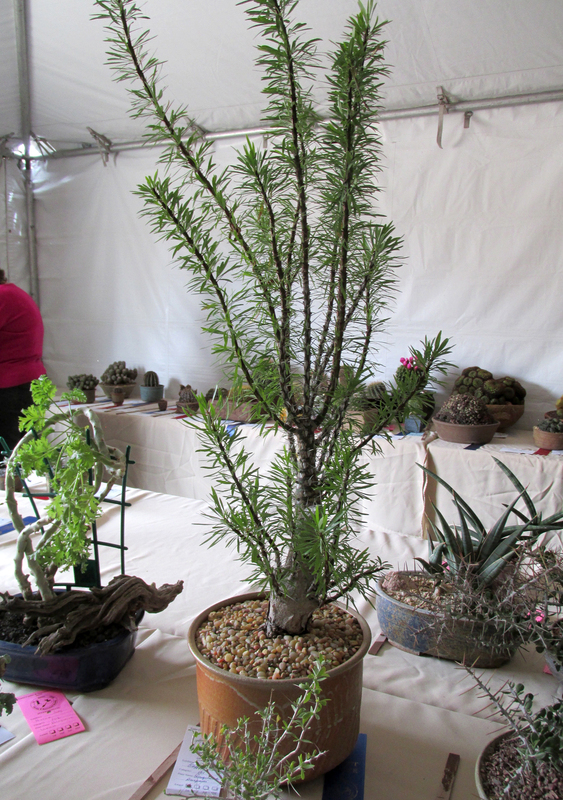 From complete newbies to masters of succulent propagation, Buck and Yvonne have been members of the GCSS for 20 years. 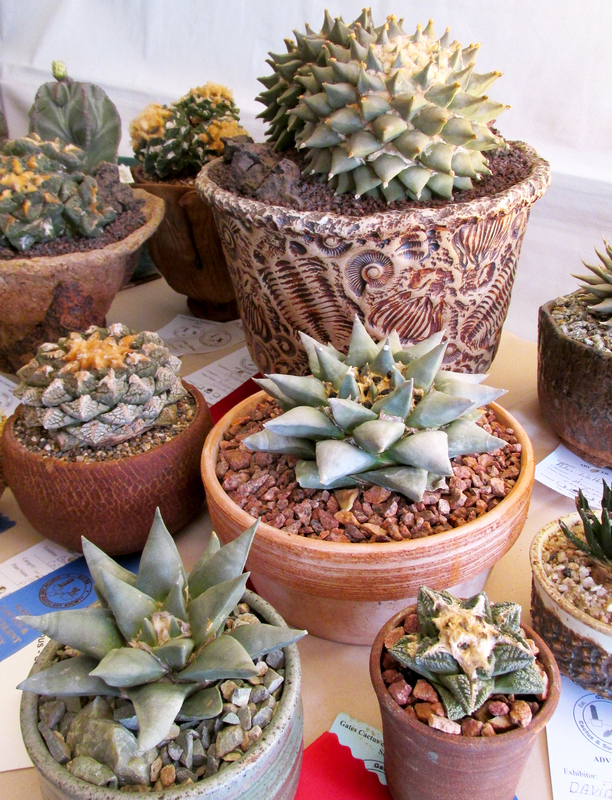 This June they will move to Calitzdorp, South Africa, to live in the land from which many succulents originated. Always friendly, and willing to share their time and information, the Hemenways will surely be missed. Click here for the GCSS website. You didn’t like my fuchsia sweatshirt? Kidding — I was there on Friday afternoon. Sorry I missed you! 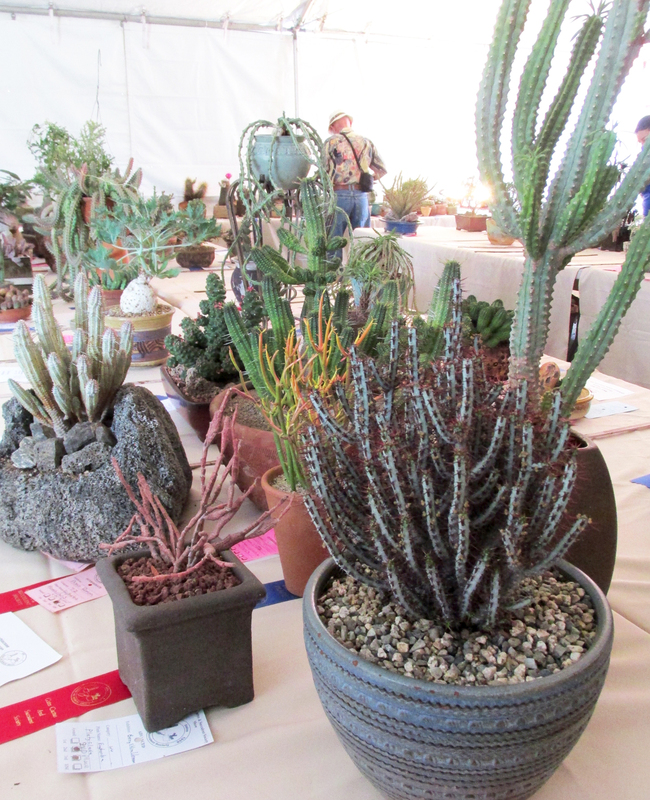 I dashed over to check out the sale after work (had a prior commitment Saturday) and didn’t get to see the show — the judges were judging and the show tent was off limits. It may have been dark and dank, and painfully crowded, but your pictures are terrific and your descriptions are divine. Thanks so much for taking one for the team and providing much vicarious enjoyment! I found myself so enthralled, amazed, tickled, and so many other such descriptive words, at the beauty, strangeness, shapes,and sizes of these plants. I agree that the lighting was bad for viewing. Whether thru a camera of any sort or by eye. Also they were too crowded. One couldn’t actually see enough of each of the plants. Luckily the people seemed to have thinned out by the time I got there. But still enough that I wished they would leave so I could really see what was there. 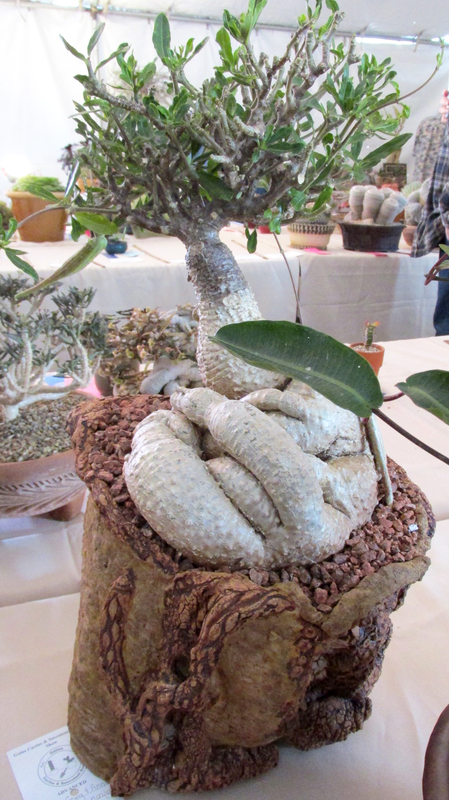 The more I learn about these wonderful plants the more I want to learn and see. Rob told me that I just missed you guys. Bummer. I think your pictures are great. As always you show me a vision other than the one I saw when looking at the same plant. Thanks!!! Thanks, Vickie, sorry we missed you. I’m afraid that all the walking and standing had triggered my flight instinct due to pain and I just had to get outta there by the time we saw Rob. 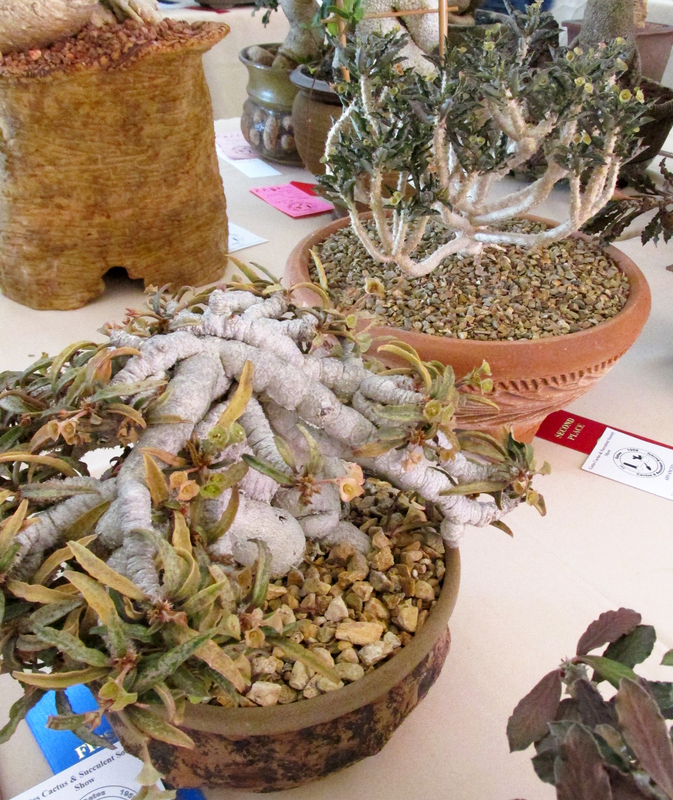 “Enthralled” is the perfect word to use when describing how one feels viewing these amazing plants! I missed it… I was in San Diego until Saturday afternoon and when I returned, I was too tired to go anywhere… darn! 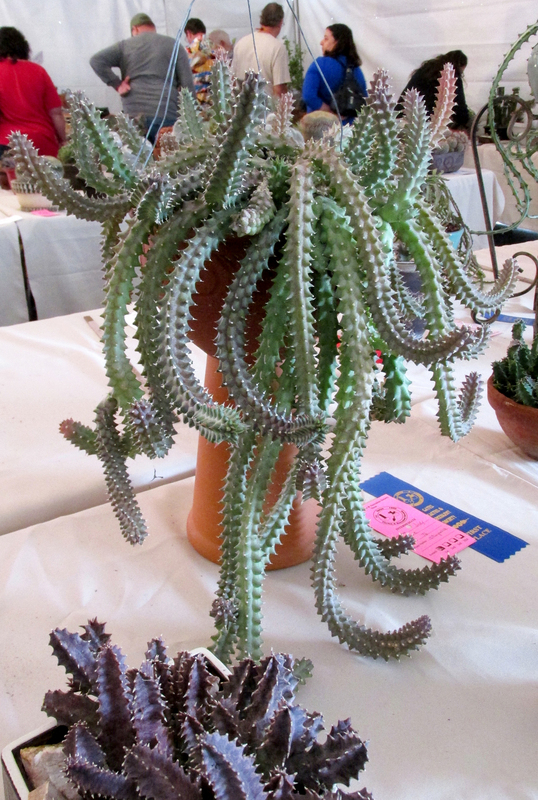 I had no idea that this is what was being showed… I thought it was just a plant sale and like you, I don’t need to buy any more plants. All that said, by all the photos that you posted, I feel like I was able to get a good feel for what was being presented. I can’t believe that you were able to get so many great photos, especially from what you described. I will definitely have to put this on my calendar for next year. Thank you so much for sharing those pictures. Your photos turned our great! It might have been dark in that tent, but at least the light was fairly neutral. We (i.e. 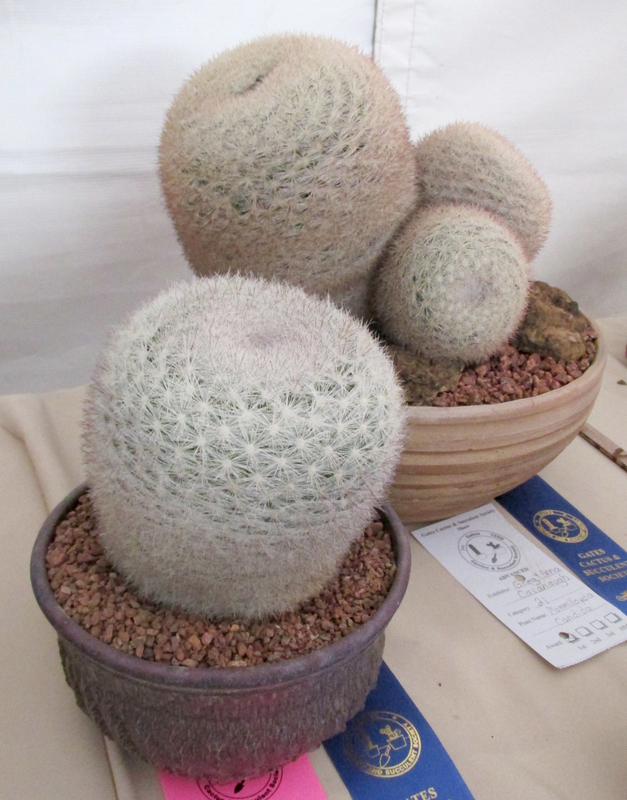 the Sacramento Cactus & Succulent Society) just had our 2015 show. The juried plants were inside, under fluorescent lighting, and all my photos have a sickly color cast I wasn’t able to get rid of (here, if you care to take a look). 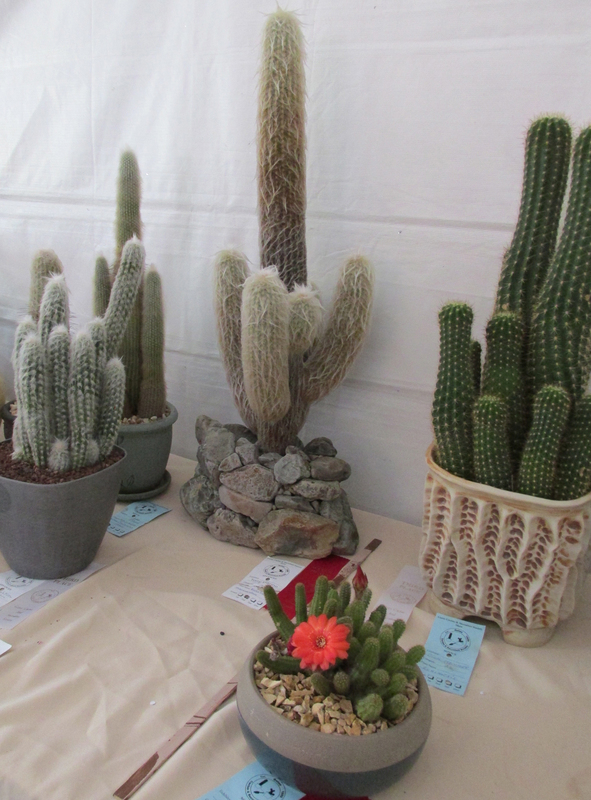 The variety of plants in our show was pretty similar, except cacti only accounted for about 1/3 of all plants entered. 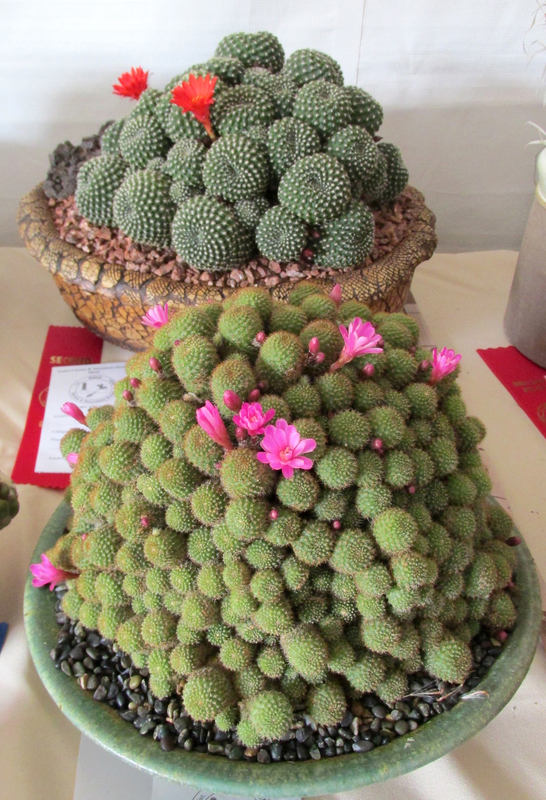 It seems that in recent years the trends has been away from cacti and towards other succulents, especially caudiciforms. 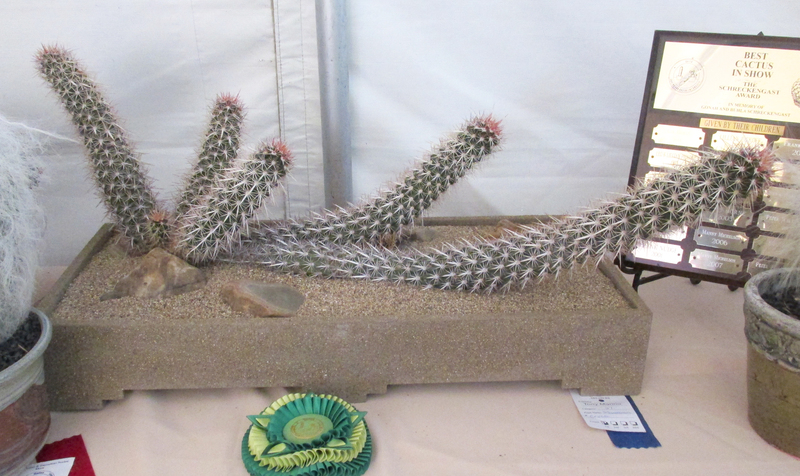 Are cacti going out of style? Hi, Gerhard, your pictures look great to me; I don’t see the yellowish cast at all. 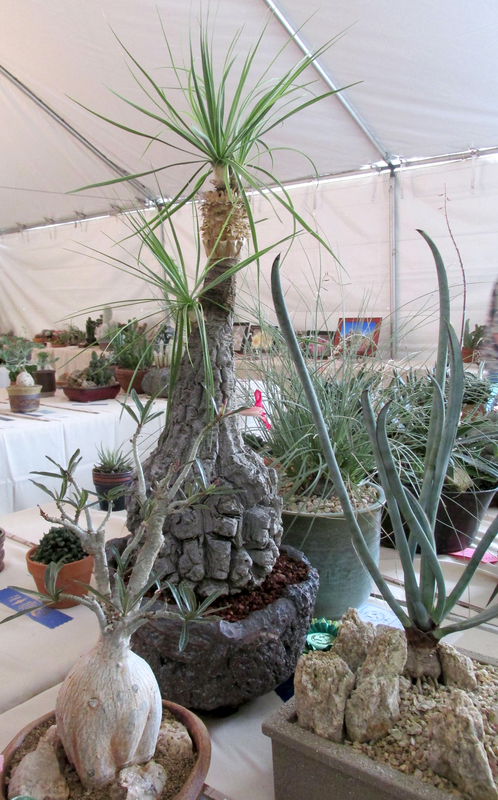 I must say there were some really “out there” plants at your show — truly amazing and completely awe-inspiring. I also have to say that your society’s presentation is light years classier than ours. Ours being more crazy quilt than viewer-friendly presentation. 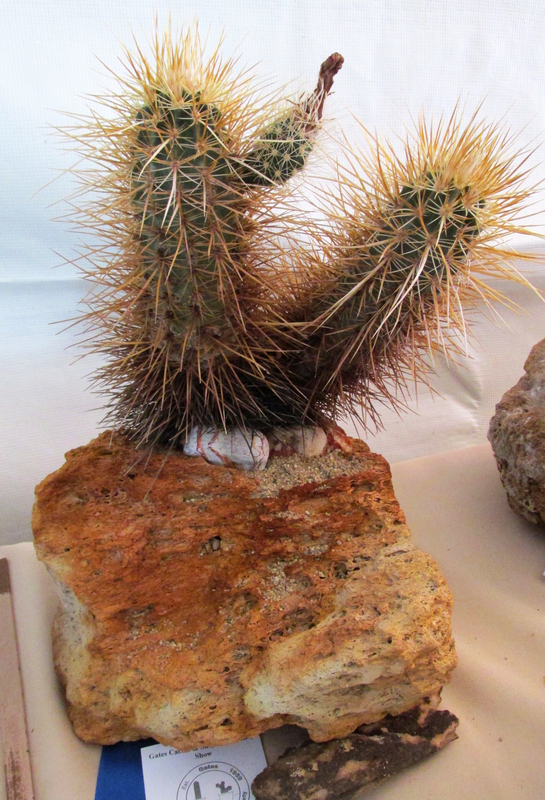 As for cactus falling out of favor: Never! I think the pendulum will swing back ’round; everything truly goes in and out of fashion. Thanks for commenting and for the link to the SCSS show. That is too bad about the crowding and lighting issues. Mob scenes are no fun. 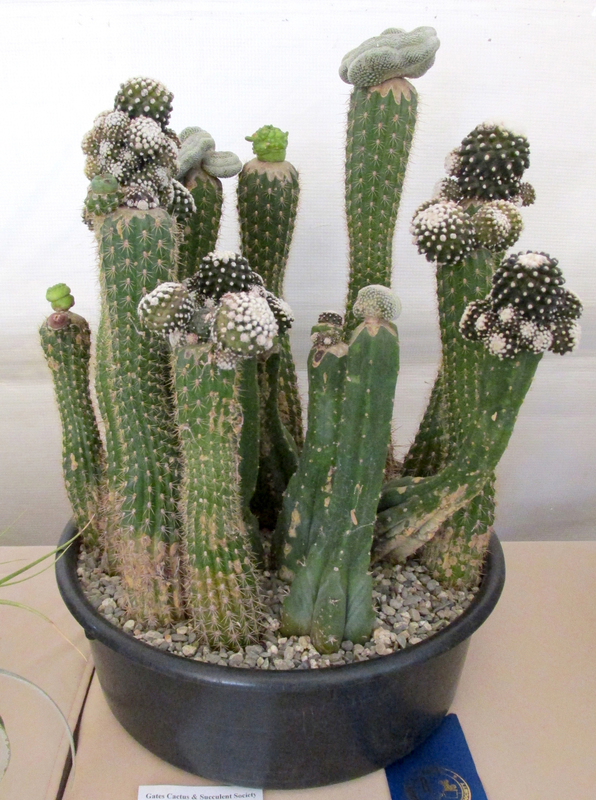 Perhaps it is a sign of growing pains – that there was a better turnout of both plants and people than anticipated? It is always a shame when some logistics failure at an event gets in the way of enjoyment. Your photos display a fabulous array of specimens nonetheless. If I saw some of these sketched or painted I’d feel sure the artist was indulging in some flights of delightful fantasy and/or potent pharmaceuticals! 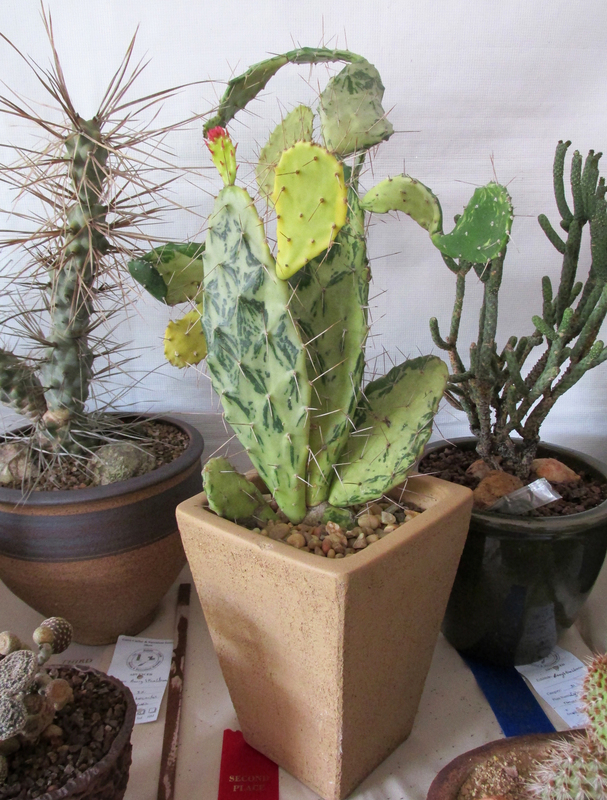 In Central Texas, cacti and succulents both get the spotlight, but currently so many folk seem obsessed with collecting plants that grow “anywhere but here” that cacti are often snubbed in the process. 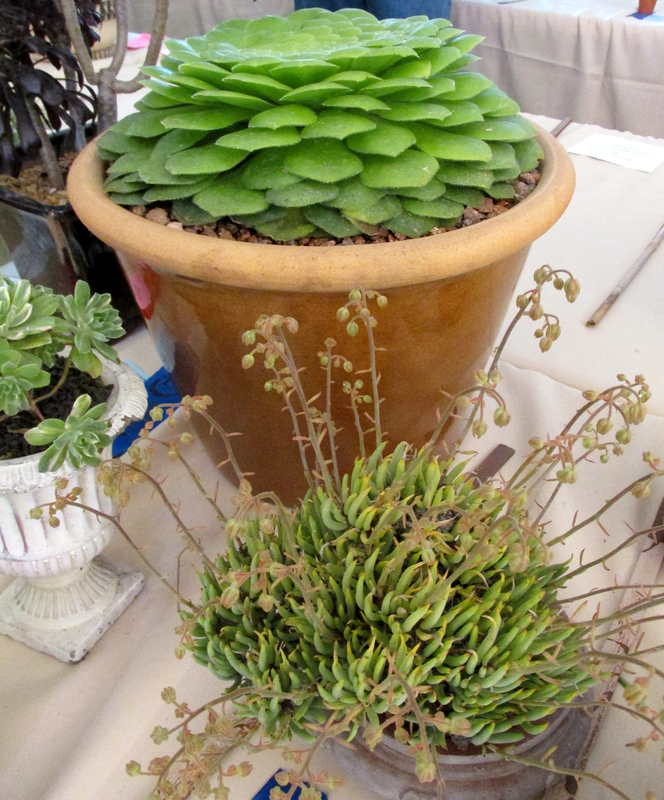 Funny how one area’s commonplace plants become another area’s most desired import! Hi, Deb — It’s hard to say why the mob scene aspect is a problem, except that at their previous venue it was the same: Too many viewers in too small a space! 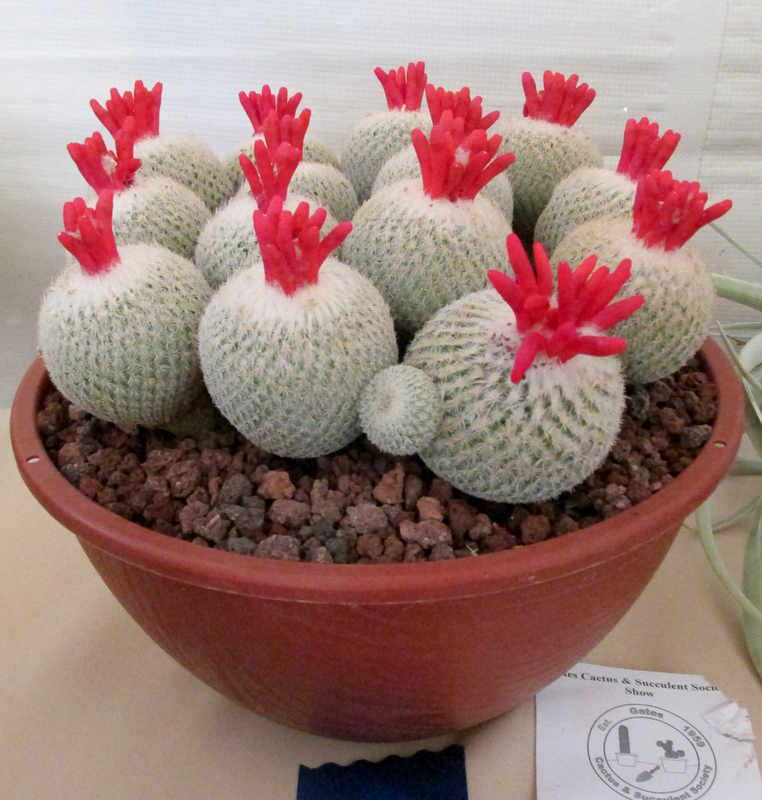 I will say, however, that they do always highlight cactus as much as any other plant. And that’s something I really appreciate. I could read you skewering the plant society set all day! And I say that with affection, because, oh, boy, am I one of them — sans the sparkly sweatshirts, at least for now! I hope Buck & Yvonne start a blog after their move, what an adventure. 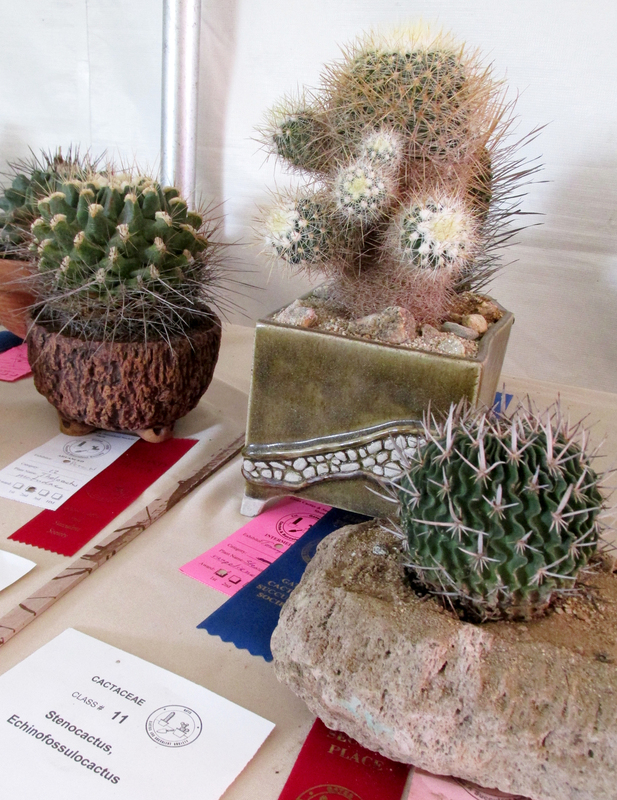 Love all your Gates show winners. 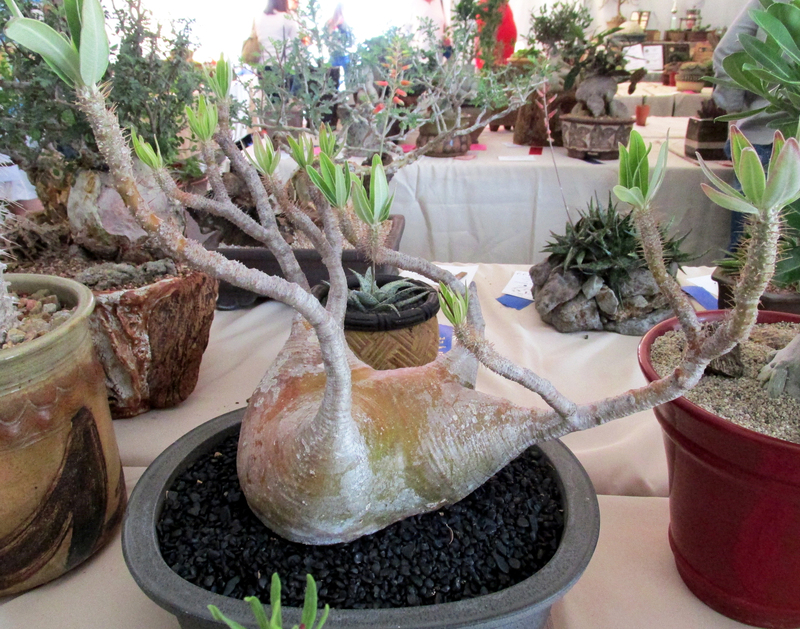 So nice to see the show plants from your point of view. Thanks, but you’re not even close, Denise — sorry you weren’t able to make it. I’m blaming my misanthropy on back pain, a fear of crowds and low blood sugar (in this case)! It would be awesome if Buck and Yvonne started a blog, I’ll have to suggest it to them. Fantastic post. Love all the pix. 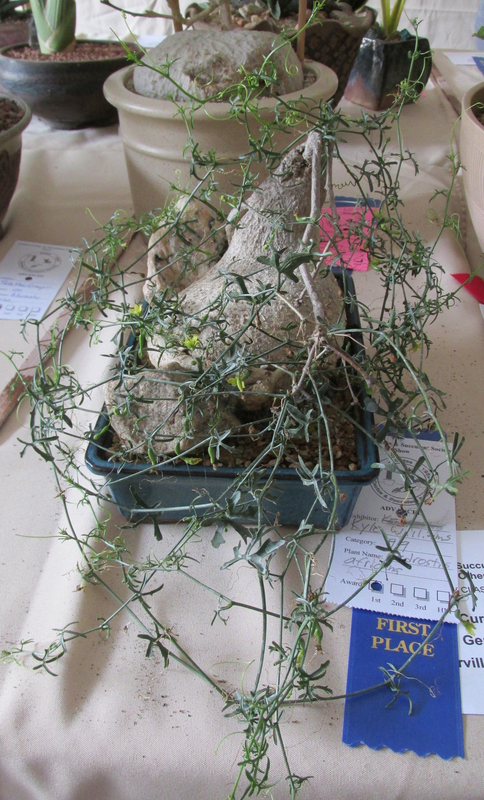 Bonsai’d euphorbias~ oo ah ooo!